As promised, here is the rundown of our wild ride from Junction City. Storm wants to test out the repairs to be sure we are getting full sway bar performance from our newly welded and beefed up bars. What better way to do that than by speeding back and forth through hairpin curves on our way to Cape Blanco? Almost any route to the Cape is laced with curvy roads so Storm chooses OR 39 to OR 124 to Hwy 101. The OR state roads have the extra benefit of being not only curvy but in some places barely wide enough for our coach. The prefect testing ground for the new sway bars. I assume this is true but since I am obviously not the mechanic in this couple you should probably double check me on this before attempting to test your own sway bars in this manner. Load bumping noises emanate from the rear of the coach for the entire duration of our trip. The sounds are similar to the popping noises made by the breaking swaybar. I quickly diagnose the problem by looking behind me inside the coach. There I discover most of our furniture in a shambles across the aisle. Test results: Storm leans the RV into the turns like he was racing his Goldwing westward, the sway bars pass his test and keep us upright and on the road. Mercifully there is no serious damage to our belongings once I restore everything to its upright position. Our Lighthouse volunteer schedule is so well organized we receive maximum time off to travel enjoying the people, places and things peppering the Oregon coast. 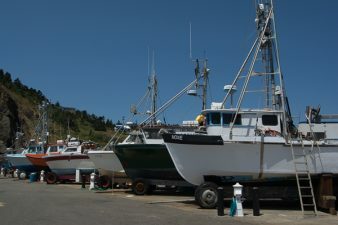 Today we head to Port Orford just south of us for some dockside seafood at Griffs. After lunch, I coerce Storm into taking me for a walk on the beach. 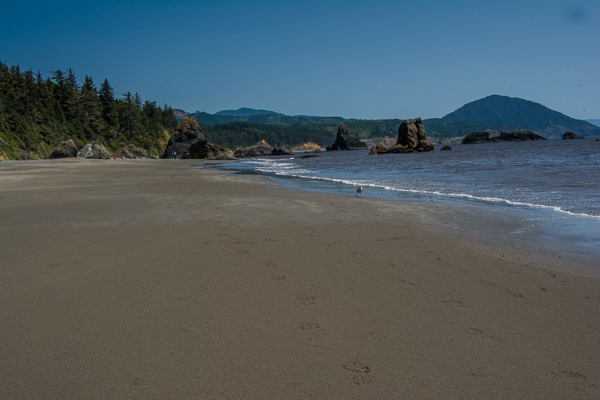 The Port Orford visitor center at the beach is manned today unlike our past visits. While inside trying to get a straight answer about Jeeping on the beaches here (no joy on that yet) I learn of an EXTREMELY ALARMING Pacific Ocean danger. Warning – The Pacific Ocean Attacks Beachcombers! Can you see the sneaker wave wave in this photo? No? That’s why they are called sneaky! They lure you near the water’s edge by littering the surf with tantalizing semi-precious agates and intact sand dollars (I have not actually seen any of these on the beach, but the host assures me they are there). While you are focused on gathering treasures, the ocean produces a freak confluence of tide and swell timing to create a monster wave that leaps to shore far further inland than any previous waves. Without any warning except a barely audible whooshing noise that is difficult to hear above the sound of the surf the wave leaps out of the surf. Even though you are not IN the water, the wave knocks you down then uses the sand it gathered coming to shore to fill your clothing and pockets with ballast. The crashing water wrestles you, helplessly numbed by hypothermia and weighted down with sand, to rest forever in Davy’s Locker. I’ve done a bit (about 5 seconds) of research on this phenomenon and apparently these waves occur most often in the winter. But what if the websites I saw were posted by the Pacific Ocean to lull us into complacency making a summer assault even more unexpected? After all, that is just the kind of planning you could expect from such an obviously organized premeditated killer. How do you avoid this chilling fate? You can stay off the beach obviously. From what I have observed that seems to be a popular choice except for the occasional tourist who has not yet been warned. Almost as bad as those sneaky rattlesnakes in the desert. We will be careful – glad to hear from you. Hope everyone there is doing well! You do have to watch those waves. We had one chase us all the way off the beach, up into the rip rap. I was faster than Nina, I stayed dry, but she got soaked from the knees, down. Enjoy the coast, it’s beautiful. Oh MY! I am so glad you did not lose Nina to a sneaker wave. We are loving the coast although on 50 knot days like yesterday, we admire it from a distance!